That’s a pretty good score on her test, considering all the running around she’s been doing that’s left her so little time to study. A card party to raise money sounds fun! Dale came up today & he made some candy & we did the dishes. Its cold today. Had a real good dinner today. Ruby, Roy & Babs came out tonite & we played peny bingo. Jimmy is home – over at Grandma’s Got here this morn. Stays till the 17th. It IS cold today. One of the coldest we’ve had so far yet this fall. I’m not really looking forward to winter coming on. Penny Bingo sounds like a good way to while away an evening after a good dinner, though. We used to play Bingo a lot when we were little, but we didn’t play with pennies or for pennies. We played strictly for the thrill of the victory! In fact, I didn’t even realize you could play Bingo for money until I was much older — (sheltered life, I guess). Apparently, I’m not the only one in my family who didn’t know too much about Bingo, though, because our cousin, Deno, had never played a Bingo game in his life until my sister and I made him try it at the tractor show one summer. You can read that story HERE — it’s hysterical! And if you’re anywhere near the Brunswick, Missouri, area today, come on out for the Brunswick Pecan Festival. It’s always a really good time, and our guild is having a quilt show in conjunction with it, as usual. There’s lots to see and do — just be sure and bring a jacket! Tonite was Freshman Initiation party. Had it in the new gym. Danced, ate & played murder. Opal nor I had a very good time cause we had so much to do. Buck didn’t get to go – he was in field. Had punch with ginger ale. Their first party in the new gym, and she was too busy working to enjoy it! And her little brother is a Freshman this year, and didn’t even get to attend the party. I’m having a hard time finding out what the game “murder” is. If anyone knows, please feel free to enlighten me . . .
Really had fun at 2nd Junior party tonite. Went to Mr. Watermans house & played ping pong, murder & some more games. Bill, Jack & Dean S. came fore it was over. Got a letter from Dale today. Mom got me a new skirt. Well, maybe now her closet won’t be so deserted any more. She’s got a new skirt to put in it. And now we know . . . her games committee chose ping pong, murder, and some other games for the party. But they had fun! I’m still curious to find out what the game “Murder” is. Have any of you ever heard of it or played it? Dale & Damon came up today & we went down after Anita (she wasn’t home), then to New Cambria Lake, back to Bevier & drove around through town, then came home & played 2 games of croquet. Oh, gimininny. Is that supposed to be “Oh, Jiminy”? Damon’s not having much luck hooking up with Anita. She’s hardly ever home when they go by! If you’ve never played croquet, I urge you to try it at least once in your life. It’ll at least be good for some laughs. We played it all the time when we were kids. We had one of the really old sets that had all wooden pieces. I wonder if it was the same set Hazel was using on this day? Hmm . . . it could very well have been. I’m staying with Judy A. tonite & we went to the Fresh. party at Macon Lake – played gray wooley. Ran around all over the park. Had fun. Nellie Skinner was there. I’m sleepy. Judy Anderson is a freshman this year. She must have invited Hazel to go to the party with her. Nellie Skinner was a sophomore from Macon High School. Nellie is a real character. She ended up having 3 daughters; the middle one was in my class in school, and we are still friends to this day. Nellie lives in Bevier and has lived in the same place the whole time I’ve known her. Gray Wooley is a game usually played when camping. Everyone divides into two groups, and each group picks a captain. One group goes out into the “wilderness” and hides, then the captain goes back and tells the other group that they’re ready. That group then goes out to try to find the group that is hiding. The group that is hiding has the goal of trying to return to camp without getting caught. The captain has signals that he yells out to his group to let them know if the searching group is getting close and they should lay low, or when it’s a good time for them to be creeping toward camp. If the captain yells “Gray Wooley” it’s a signal for all of his group members to run to camp as hard as they can because the other group is far enough away that they can’t catch them. Sounds kind of fun, huh? Have you ever played it? Donald’s 12th birthday — Went to Dave’s & Ruths tonite & had ice cream. I played murder with Buck, Puz & Reese – Beat Puz & Reese. Me, Mom, Buck, Puz played murder (a game) all day. I heard my requests on radio. Mine & Don’s names. I baked Donalds cake – was good, too. So Buck is 12 . . . and she made him a cake. Sounds like he had a good birthday, what with ice cream, playing games all day, and hearing his name on the radio. Do any of you out there know anything about the “murder” game? Ever play it when you were young? I’ve never heard of it. 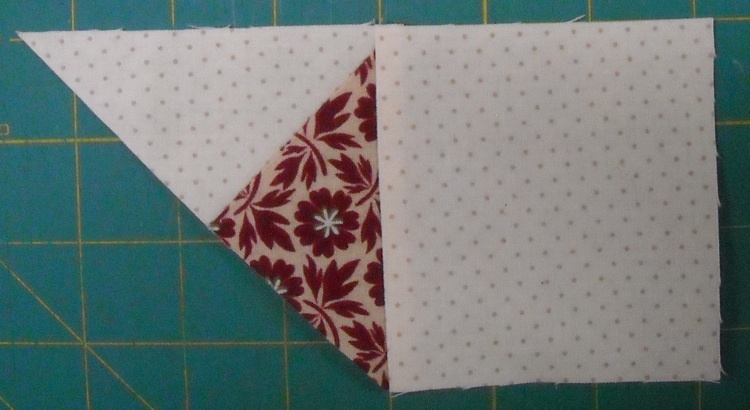 Today you’ll need 4 of the triangle units from your “Block 10” baggie, the ones that look like this (with Fabric #4 on the left). 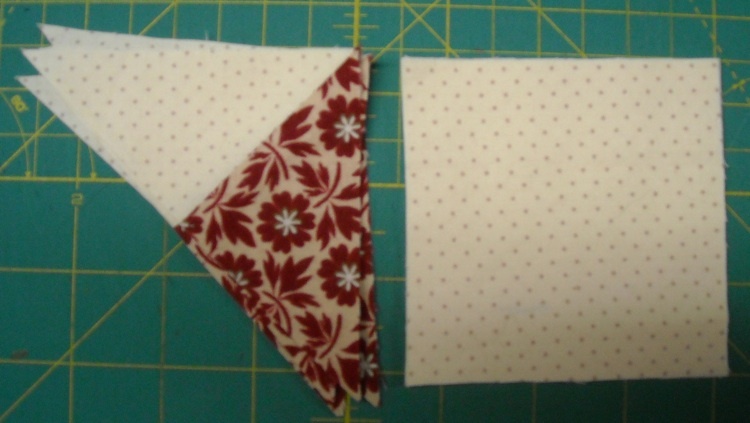 You’ll also need the 4 squares of Fabric #4. Lay them out as shown. 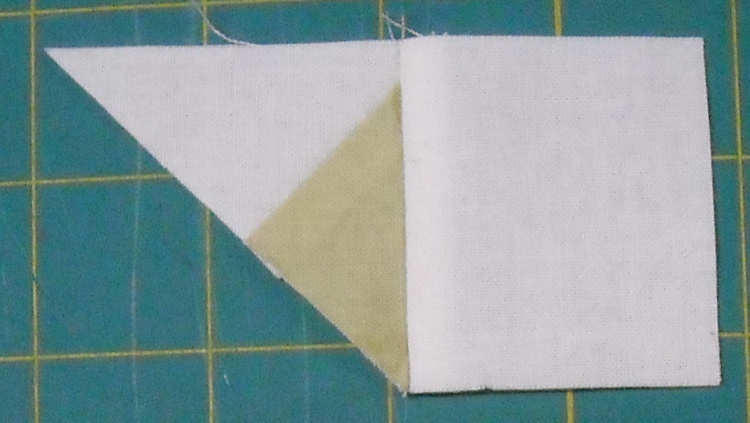 Flip a square over onto the triangle unit, right sides together, and stitch. 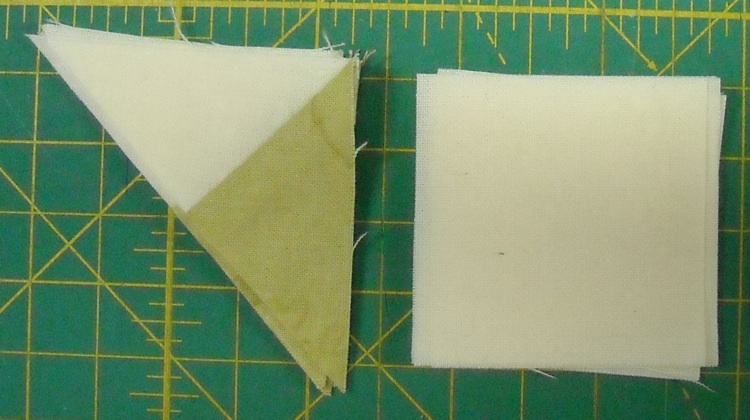 Press the seam toward the square, and trim the dog ears. Repeat for the three remaining pairs of pieces. Store them back in your “Block 10” baggie.